You know that PlayStation phone we've been hearing about for, well, seemingly forever? Engadget says it's finally happening in the form of Sony Ericsson-developed, Android-based hardware that's PSPgo-like in form. That long-rumored elusive PlayStation phone could even hit this year. According to Engadget's report, that PlayStation branded phone will be based on the Android 3.0 platform, sport a 3.7 to 4.1 inch WVGA or better resolution screen, (possibly) a 5 megapixel camera and a 1GHz Snapdragon CPU. For controls, the device is said to feature the PlayStation standard d-pad and face buttons, plus a "long touch pad" for analog controls. Hardware-wise, Engadget describes it as "a cross between the Samsung Captivate and the PSP Go" and probably much better looking than our mock-up. On the games front, original PlayStation titles and PSP games like God of War and LittleBigPlanet are name-checked. Modern Warfare, which has never seen a PSone or PSP iteration, is also mentioned as a title "possibly on tap" for the device. Much of that seems to match up with a Wall Street Journal report from earlier this year that heralded a Sony Ericsson released PlayStation phone some time in 2010. 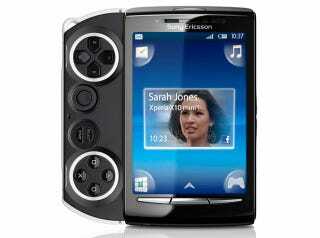 If Sony Ericsson does have plans to unveil the long-rumored PlayStation phone, it has Gamescom and Tokyo Game Show still left to do it. With PSP game releases on the decline, the time may finally be right.